Fireworks mark the end of Philadelphia's Fourth of July celebration. 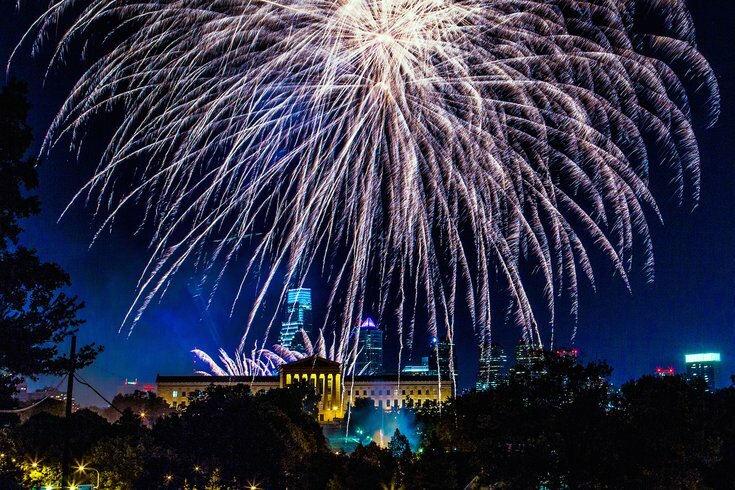 Five major fireworks shows will light up the skies in Philadelphia on the Fourth of July holiday weekend. From July 1 to 4, three Wawa Welcome America! shows will entertain crowds after free concerts, while the Phillies will shoot off fireworks over Citizens Bank Park after two home games. Following a free concert on Penn's Landing by the Philadelphia Orchestra, a rollicking soundtrack featuring Boyz II Men, Pink and other "Sounds of Philly" will accompany fireworks over the Delaware riverfront. That same night, pyrotechnics will fill the air over the ballpark after the Phillies take on the Kansas City Royals. The U.S. Army Band Pershing's Own gets the Penn's Landing party started with both patriotic tunes and modern hits. Then fireworks, choreographed to the musical score of "America, My Home Sweet Home," will flash in the night along the riverfront. More fireworks will follow the second game between the Phillies and the Royals. The holiday leads off with patriotic ceremonies and a flag-waving parade in the morning, free family fun and games on the Benjamin Franklin Parkway in the afternoon, followed by an evening that celebrates Philadelphia's musical legacy. And fireworks. This year's show will include musical accompaniment that recalls the journey from July 4, 1776 to July 4, 2016, with music and inspiring quotes from American presidents and other historic figures highlighting the "America Starts Here" theme. For more information, visit www.visitphilly.com.